Over the years I have had some great discussions with my clients and colleagues about the value of method and mechanics over the importance of theoretical understanding and driving principles. Both have merit, and good trainers will certain be able to apply effective method and mechanics to their work, but without an understanding of the underlying theory/ principles, they will become stuck from time to time when their method/ mechanics fail. The beauty of understanding principles is that it actually allows creativity of approach. Following a method is like following a recipe, if you stick to the rules it ought to work. But perhaps your oven has a faulty thermostat or your scales aren’t very accurate. Or maybe you are missing some of the ingredients. If you carry on and follow the recipe exactly, the end results may not be as tasty as you’d hoped. However, if you have an understanding of the theory of how various ingredients work and interact, and the effect of varying quantity and heat, with a creative approach you can tweak the recipe and make it work, even if you haven’t followed it to the letter. In fact, you may be able to take the recipe, shake it up and do something a little different that actually produces a better end result. Someone watching you who is only comfortable with following the method may find it somewhat worrisome to see you ‘breaking the rules’ and ‘thinking outside the box’…. They will be sure that you are going horribly wrong and heading for disaster. However they only feel this because they don’t understand the principles: you have taken them out of their comfort zone. The resulting cognitive dissonance might lead to them refusing to taste the food and therefore failing to recognise the value in what you’ve done. Or, perhaps they will take the brave step of trying it, recognise that it is, in fact, very tasty, and so open their minds to the possibility that if they learn more about the principles, they too could become creative bakers! I experienced this cognitive dissonance from an observer at a demo a couple of years ago. They watched what I was doing, and, instead of understanding the principles that we were talking about, focused on the fact that what I was doing looked very different to the way they’d been taught. The observer, a pleasant, well meaning fledgling trainer who followed a method, subsequently offered me some advice on where I was going wrong and very kindly offered to help me learn the method that they knew. Being a polite (and I think generally a reasonably nice) person, I said thank you very much, but perhaps they had missed the point that we had been illustrating at the demo? I suggested that they might like to come and see me train so we could have a chat about the various approaches and I could better explain/ demonstrate the theory behind it all. I was rather taken aback by the whole thing, but it was a useful, if uncomfortable, lesson for me at the time (on a variety of points, including being more careful about how information is conveyed) and a spur (Hmmm, did I say I can also be a rather contrary person?!) to keep doing what I was doing. 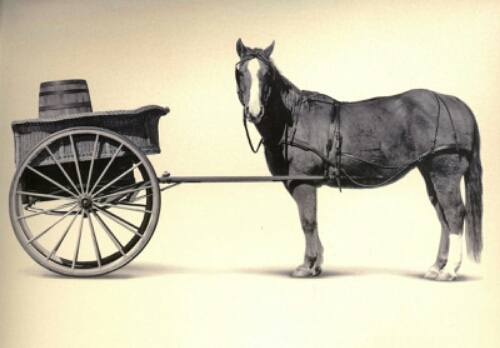 The method and mechanics of what you do are the cart. The driving principles and theory are the horse. A well made cart will have the potential to travel smoothly and hold it’s structure under pressure. However, without the horse, it will never move. One of my clients a number of years ago made the excellent point that method really helps new trainers, people who are just beginning to understand the basic principles of how we train horses. The method helps them to establish some of the basic points. On this I do agree with her. But I feel it is so so important to teach the principles, because without them, the fledgling trainer is stuck in a box and cannot progress. Some trainers rely on this as a way of maintaining loyalty among their followers (consciously or unconsciously). It also maintains the status quo, since it means that no one ever knows the system as well as the leader, therefore no one can surpass the leader. I believe that, as a trainer of trainers, to be the best that I can be, I need to share the knowledge I have about the theory, the principles, so that the trainers I train can develop their own understanding and creativity. In this way, they bring something extra to the mix, and have the potential to develop new and better ways of doing things. These trainers will always have the potential to surpass me, and that is as it should be. If you like, I fulfil the role of the signpost or the light on the path, perhaps as the catalyst for the journey. But I don’t do the journey for them, and I don’t determine the final destination. If they wish, they can keep on peering over the next hill, round the next bend. The benefit to the horses is that, with compassion and thoughtfulness, in combination with understanding theory and principles and how to put them into effective practice, we keep evolving the whole field of horse training.